Today we offer you an e-liquid review « D"It's been a while since we received the full range of tests" revolute", A French brand that offers everything you need to make your e-liquid at home! As often, you will have the choice between the video review and this article (or both) so that the test is really the most complete possible! Before revolute did not see the light of day, this company / French laboratory proposed e-liquids already ready of the brand « Nicoflash", Their goal: to position themselves with a triple requirement: experience, transparency and production 100% Made in France. With the experience and evolution of the vape in France, they decided to put on sale enough to make their own e-liquid with a minimum of constraint and the best possible quality. revolute proposes nicotinized bases, aromas as well as additives. Clearly, you just have to take your gloves, glasses, vials and pipettes to prepare the potions to your taste! REVOLUTE: PERFECT TO START THE WORLD "DIY"
It's a long time since we had to deal with our base, our bottle of aroma without any indication, the time we spent hours searching to find out how many drops were needed per recipe ... revolute thought of everything! Their goal is to make the creation of e-liquid accessible to all, they have prepared this table that will allow even the most novice to concoct small e-liquid very easily. Percentage of aromas needed, number of drops, maturation time ... Everything is indicated in this leaflet, you just have to choose your recipe and follow the advice. After with the " Do it Yourself"Everything is possible, and if the recipe is not to your liking, you can improve it by adding other flavors or additives (be careful not to have too heavy hand!). To shorten it, revolute do not just offer products, they also give you reference points! THE REVOLUTE OFFER: A REALLY COMPLETE CHOICE AND RAPID PREPARATION! And for everyone to find his account " revolute Offers a broad range that continues to grow. For bases you will have the choice between 4 different nicotine levels (0mg /6mg / 11mg /16mg) and between 5 different proportions (70% vg / 30% pg ou 30% vg / 70% pg ou 50/50 ou 100% VG ou 100% pg). For aromas, there is first the simple range which has more 15 flavors (peach, strawberry, apricot, caramel, bubble gum, apple pie ...) and the high-end range that currently has 5 (snap pear, umami ...). Finally you can improve your creations with additives (Ethyl maltol, Ethyl vanillin ..). What can be appreciated with Revolute in comparison with other brands is the speed of maturation of the preparations: It will only take a few days of "steep" to your preparations to be ready for consumption! If you are going into the DIY "Do it yourself", consider protecting yourself with a pair of gloves and if possible appropriate safety glasses. This will be even more important if you make preparations with bases that have a nicotine level greater than 10mg. 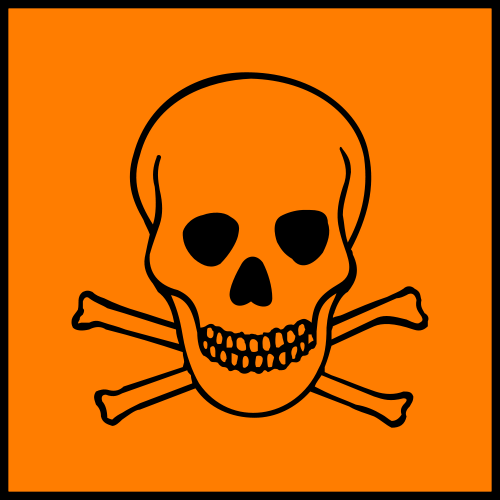 Nicotine remains a toxic product that enters your body on contact with the skin, an overdose can manifest itself by the following symptoms: headache, malaise, dizziness, dizziness. To avoid this, simply take these few precautions. WHAT RATE FOR REVOLUTE? IS THIS REALLY INTERESTING? 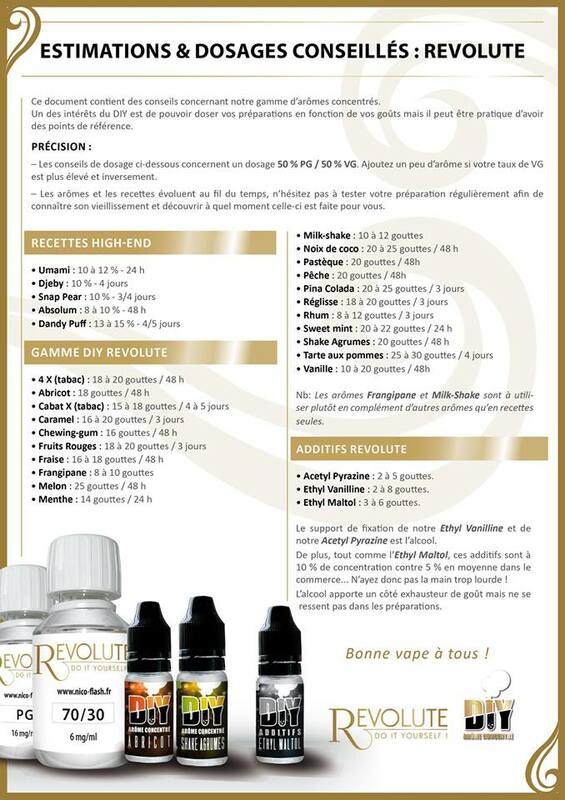 Here are the prices for products in the range « revolute "
At the fare level, if you start on the most expensive bases with a base of 16mg and a "high end" aroma, the cost is about 2,16 euros / 10ml, if you start on a basis of 6mg with a "simple" aroma, the cost will be around 1 euro / 10ml. Clearly, this is interesting for someone who wants to save money by preparing e-liquids at home. REVOLUTE: THE NOTICE OF THE DRAFTING "VAPOTEURS.NET"
It will be difficult to criticize this brand " revolute The range is reliable and will allow many vapers to save money. Multiple flavors, nicotine choices, in proportions Pg / Vg ... revolute thought of everything. But where its products really stand out is in the speed of maturation! What a pleasure to have your e-liquid home so quickly. In relation / quality / price, « revolute "Is really well placed and offers all vapers (without exception) the ability to easily make an e-liquid to their tastes! 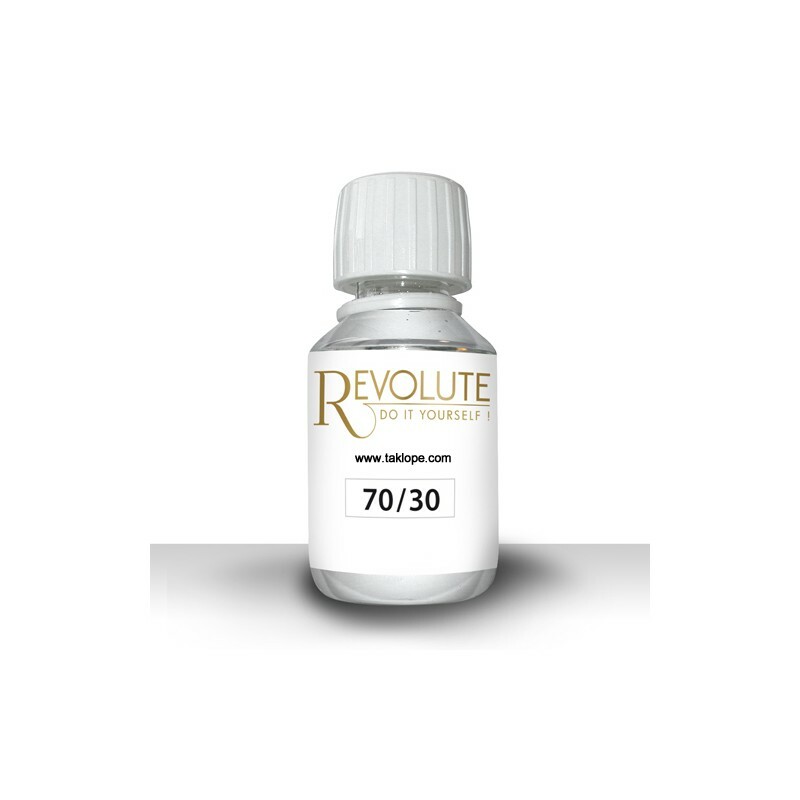 Find the brand « revolute »At« The little vaper«,« Taklope And many other shops. Following : KANAVAPE: The co-founder in custody! and what would you have a Skype that we can talk to each other for a long time? because here I buy the product revolute 30 / 70 3 mg / ml but the mg / ml well nicotine dosage if I'm not wrong? - It does not matter how many ml of liquid you want to make, it is necessary to dose your aroma to 15%. in clear for 10ml you do (10ml x 15) / 100 = 1.5ml. So you'll put 8.5ml base nicotine and 1.5 ml aroma to make your 10ml e-liquid. For 30ml same principle: (30ml x 15) / 100 = 4.5ml. So you will put 25,5ml base for 4,5ml aroma to make your 30ml of e-liquid. If you want to put several flavors to you to measure to stay in 15%. If it lacks taste you can add additives and dose a little stronger in aroma. The dosage remains very personal. Hoping to answer your question. Good night.